Fans of English soap-operas should enjoy this dramady (drama-comedy) novel set in Italy's beautiful Tuscany region. Rich, poor, criminals, priest... all the usual suspects for soaps are present. The story is set in 1987 when Italy was dealing with kidnappings and homegrown terrorists. The protagonists in this multi-strand tale deal with all sorts of odd happenings, with love stories at the center of most of it. The author keeps all events, not matter how serious, light, with superficial emotions attached to them. Very English tongue-in-cheek humor dots the story throughout. One rich family in possession of a large estate acts as a hub around which all the other characters and events circle out. We get to know the thinking of lots of locals and ex-patriots through the drama, gossip, and farcical situations. The ending brings all the people and story threads together with a semblance of a happy-ending. This is a beach read, or something to enjoy when relaxing poolside, preferably with a view of Tuscany, and a cool drink in hand. A comic novel set in the scenic Tuscan hills. When the Duke of Grambörg announces over breakfast that he will sell the old family villa in the Tuscan hills to move to New York, his family is in uproar. Where on earth will his beautiful daughters, the contessas Claudia and Hanna, live – now they no longer have the family seat? And that, as it turns out, is just the beginning of the escapades that ensue after the old Danish duca makes his life-changing decision. Will local poor boy-turned rich man, Osvaldo Cipollina, find a way to buy the villa? Hopelessly in love with Hanna, will he ever manage to persuade her to see past his humble beginnings, not to mention his dubiously acquired wealth, and return his feelings? Will the haughty Claudia ever be reconciled with her aristocratic husband: Lord Eastcliffe? With a cast of characters as rich as a medieval tapestry, there is just no knowing what will happen next in this finely tuned comic novel. From Lo Strapazzato – “The Scrambled One” – who is a little too fond of arson, to the international diamond smuggler with a taste for fine wines, to the mysterious American cousin of Osvaldo’s who arrives wearing a veil – everyone in this corner of Italy, it seems, has a secret. 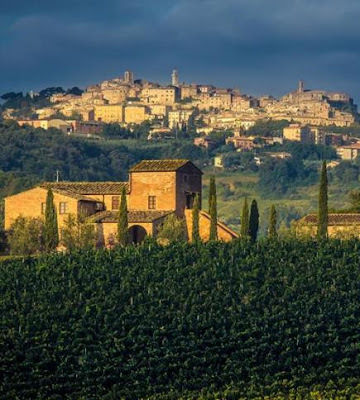 That’s not to mention a sultry belle from the American deep south, an Australian crooner, and, at the heart of it all, the perfect sunshine of the Tuscan countryside. 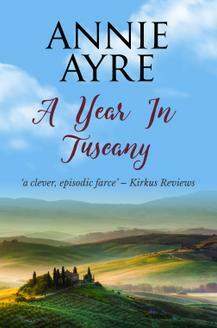 A Year In Tuscany is a delightful story that will appeal to lovers of the English comic novel.